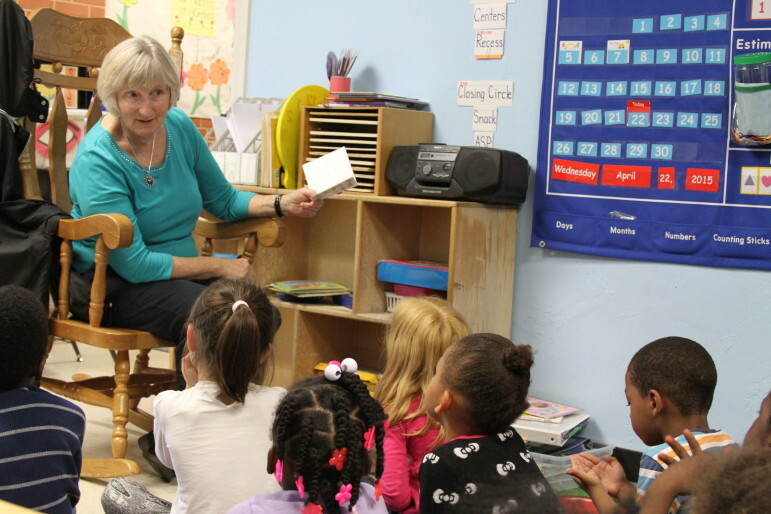 A volunteer at Positive Tomorrows, an Oklahoma City school for homeless children, reads stories to students there. Underwear, shampoo and sneakers line the shelves of Positive Tomorrows’ supply closet. The items reflect the basic needs of the school’s students. All are homeless. Positive Tomorrows is a tuition-free private school that serves homeless elementary-age students in Oklahoma City. The demand is so great that the school has had to turn away scores of families applying in recent years. This year, the school, which has room for 58 students, turned away 72 children. Last year, when its capacity was 48, it turned away 109 students. In 2012-2013, it turned away 45 applicants. School President Susan Agel said the school tries to find other local agencies to help families of students who are not admitted. One reason for the drop in rejections this year was the addition of a new classroom accommodating 10 more students. Positive Tomorrows, which is K-5, mixes grades in the classrooms to ensure each room is full. “We’ve worked really hard at using every resource available so we can serve as many students as possible,” Agel said. School officials said that providing basic items such as clothing and toiletries frees up parents to focus on other matters, such as finding a job or obtaining a GED or college degree. Candy Cole, a mother of three, said the school has been a blessing for her oldest son, Kyle, 7. Cole became homeless after her mother left Oklahoma City to take care of Cole’s ailing grandmother in Portland, Oregon, last September. Cole said her mother babysat her children while she worked at a bail bond agency. Without her mother to help, Cole said she had to quit her job because she couldn’t afford childcare and couldn’t find someone to watch her kids all day. She was evicted within a month after failing to pay rent. Cole said she is comforted knowing her son attends a school where every child is or has been homeless within the past year. The school and teachers see the daily struggles of homeless students. Students may show up hungry, tired from sleeping on a floor or in a shelter, or they may lack clean clothes and a place to shower. In each case, teachers and staff work to address those challenges so students can focus on classroom tasks. Agel said Positive Tomorrows wants to expand to help more students. The goal is to have space for up to 175 children. The school is looking to renovate its existing building or move into the nearby Epworth United Methodist Church, which the school purchased in December. The school now has four classrooms squeezed into its building.